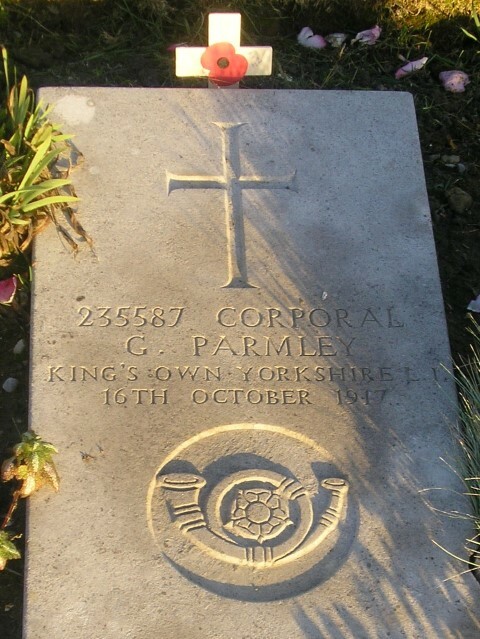 235587 Corporal George Parmley, 1/4th battalion, the King’s Own Yorkshire Light Infantry died of wounds 16 October 1917 and is buried in Wimereux Communal Cemetery, France. He was 27 years old and is commemorated on the Evenwood War Memorial and the Roll of Honour, St. Paul’s Church, Evenwood. In 1901, the Parmley family lived at Gordon Lane, Ramshaw. 40 year old Joseph worked as a coal miner (hewer). Thomas born in March 1918, 5 months after George was killed. Selina died 22 February 1919 from influenza leaving her mother to look after her 4 children, all under 10 years of age. The 49th Division served with distinction on the Western Front throughout the war. The 4th Battalion arrived in France in April 1915 and within three weeks was in the thick of the fighting at Hooge. Because Corporal George Parmley was not awarded the 1914 or 1914-15 Star he did not enter France until after 31 December 1915 so he did not have taken part in this action. Long periods in the line followed until in the summer of 1916 when, from July to September, the Division took part in the battle of the Somme. The “Third Ypres” offensive cost the British nearly 310,000 casualties, the Germans slightly less and it consumed all of the available reserves. The village of Passchendaele was entered 6 November and the whole campaign ended a few days later when more of the ridge was taken. It achieved none of its objectives although the Germans could no longer look down on the Ypres. The Salient had been deepened by about 5 miles and the Germans had been prevented from attacking the French when its army was in disarray following the failure of the Nivelle Offensive. From the outset, it was obvious to the German Fourth Army that a new attack was being prepared and the previous year they had begun to strengthen their defences. 11 July: an air offensive began. 31 July: the attack itself began when the British Fifth Army attacked north-east from the Ypres Salient. Initially, good progress was made but a strong counter-attack resulted in only a 2 mile advance. Heavy rain fell on the first night flooding the swampy ground whose drainage system had been totally destroyed by the 10 day bombardment. As a result the whole operation was held up. 9 October: The 49th Division formed part of the Second Army which together with the 66th Division was attached to the 2nd ANZAC Corps. The attack was scheduled for 5.20 on the 9th October. General Plumer’s Second Army, the II Anzac Corps, comprising the 49th and 66th Divisions would lead the attack and advance along two parallel spurs towards the flattened village of Passchendaele. Two brigades from each division were selected for this action. The offensive was of the established tradition on the Western Front – a massive artillery bombardment in theory would stun and disorganise the enemy front line troops, knock out his machine-guns, cut wire entanglements, neutralise his opposing batteries then the infantry would advance behind a creeping barrage and occupy the ground. Tanks would not be used – they would not be able to cross the gluey battlefield. There was no military innovation. The front was 8 miles in width and it was planned to take the advance 4 miles. About 31,000 British and 6,000 French would participate. The German Fourth Army lay in wait, 100 yards away in some places such as the flattened village of Poelcapelle held jointly by both sides and fully a mile away elsewhere. The following account will concentrate only on the action of the 49th Division. It commenced the march from its assembly areas east of Ypres at about 7pm in order to arrive at the jumping-off positions by midnight. “Nine thousand drenched troops began their march at dusk in full battle order – water bottle on the right hip, haversack moved rearward, an extra 50 cartridge bandolier over the right shoulder and under the left arm and a Mills bomb in each side pocket. The 49th (1st West Riding) Division encountered such problems and just made it on time. The Germans shelled the roads with their heavier guns causing hundreds of casualties. By one way or another, the Allied troops had splashed their way to their assigned positions. Bayonets fixed awaiting Zero-Hour. The rain continued. German eyes surveyed the wasteland and the enemy front from thousands of fortified pill-boxes and observation posts virtually undamaged by the bombardment and protected by 2 belts of dense wire entanglements had not been broken up. the Ravebeke, a little canal shown on the maps to be only 5ft. wide that day spread to 150ft. with water waist deep in the centre and one of the 2 brigades, presumably the 148th did not cross it. The 146th Brigade crossed further north and advanced several hundred yards to be hit by shrapnel and heavy machine-gun fire from pill-boxes on the higher ground. Messenger pigeons released to communicate with HQ were so terrified by the din of the German barrage that they refused to leave their bearers. By 10am, the German 16th Rhineland Division was “master of the field”. The 49th Division suffered 2,585 casualties and had not advanced at all. The 66th Division had lost 3,119 men, and gained 500yards of No-Man’s-Land but had not even dented the main German positions on top of the ridge. The 2nd Australians suffered 1,253 casualties and had not advanced their line. Orders were received on the 7th October, 1917, from the 148th Infantry Brigade that the 49th Division would resume the Offensive West of Passchendaele on the 9th October 1917 in conjunction with the 66th Division on the right and the 48th Division on the left. The attack of the 49th Division was carried out with two Brigades. 148th Infantry Brigade on the right. 146th Infantry Brigade on the left. The 147th Infantry Brigade being in reserve. The attached map shows the frontage, Battalion boundaries and objectives allotted to the 4th Y & L Regiment, 5th Y & L Regt., and the 5th Bn. K.O.Y.L.I. This battalion was in reserve with orders immediately after zero to take up a position in reserve on the South Side of the WIELTJE Road immediately north of the RAVEBEEK. At 12.15 a.m. the Battalion led by LT. COL. H. MOORHOUSE, D.S.O. moved from the Old German front line, immediately followed the 5th K.O.Y.L.I. The night was intensely dark, the trench grid track was in bad repair and progress was consequently very slow. The head of the battalion reached the support line behind ABRAHAM HEIGHTS at zero. This was at least 800 yards from our position of assembly. Before the battalion had closed up the enemy placed a heavy barrage on the ridge and caused a certain amount of delay and a number of casualties. The Commanding Officer issued orders to the battalion to move forward in attack formation in two waves. Z.Coy. on the right and X, Y & W Coys on the left. In the advance on the forward slope of the ridge many casualties were caused by enemy machine gun fire at each side of and from a strong enemy position of the BELLE VUE SPUR. 2/Lt. P.F. BEAUMONT was killed and Captain J.W. MOREHOUSE. 2/Lt. H. NICHOLIS, 2/Lt. J. BRANALD, and 2/Lt. W.B. GREAVES wounded at this stage of the operation. To take up our position north of the RAVEBEEK companies were forced to close on to the MEETCHEELE-GRAVENSTAFEL road on account of the condition of the ground caused by the overflowing of the RAVEBEEK which was badly damaged by shell fire. On the left, enemy machine gun and rifle fire caused many casualties and on the right many men were temporarily lost owing to the fact that it was impossible to get them through the mud. Requests for reinforcements were received from the 5th Y. & L. Regt., on the left and the 4th Y. & L. Regt. on the right. Z & Y Coys under LIEUT. G.H. CHADWICK and CAPT. R.W. MOORHOUSE respectively were sent forward on the left and W & X Coys under LIEUT. G.H. BROOK and 2/Lt. G. E. PARSONS (Capt. J.W. MOREHOUSE having being previously wounded) on the right. The advance up the slope was done by sections owing to the heavy machine gun and rifle fire from WOLF COPSE on the left and BELLE VUE on the top of the ridge. During this advance CAPT. R.W. MOORHOUSE was killed whilst gallantly leading his company. Many casualties in the ranks were also suffered. Half an hour afterwards LT. COL. H. MOORHOUSE, D.S.O. was also killed by a bullet when leaving his headquarters. Owing to the heavy machine gun fire and the fact that the companies averaged not more than from 30 to 40 strong a position was taken up by Z and Y Coys on the slope about 400 yards N.E. of the point where the RAVEBEEK crosses the road, while W & X Coys formed a defensive flank on the right of the 4th Y. & L. Regt. A large gap having occurred between the battalion and the 146th Infantry Brigade on the left a defensive flank was formed by a party of Z Coy. 5.30 p.m. The enemy intensely bombarded the area from the Ravebeek to the top of ABRAHAM HEIGHTS for at least an hour. A party of the enemy who were assembling on the BELLE VUE SPUR were dispersed by rapid fire and no counter attacks developed. Intense enemy bombardment of our forward area. 7p.m. An attempt was made by a party of S. Company under Capt. T. Chadwick to take two Pill Boxes on the crest of the Ridge. These were found to be so heavily wired that it was impossible to get near them. The battalion under the command of CAPT. T. CHADWICK was relieved by the New Zealand Imperial Force, and bivouacked the night in a field near the Asylum, Ypres. Killed: LT.COL. H. MOORHOUSE, D.S.O. 2/LT. P.F. BEAUMONT and 17 other ranks. Wounded: 2/LT J.W. HUNTINGTON, 2/LT. W.B. GREAVES, CAPT. J.W. MOREHOUSE and 2/LT. H. NICHOLLS and 147 other ranks. Wounded and missing: 2/LT. J. BRAMALD. It must be assumed that 235587 Corporal George Parmley, 1st/4th K.O.Y.L.I. was one of the 147 other ranks wounded. It is confirmed that Lt. Col. H. Moorhouse, Capt. R.W. Moorhouse, Second Lieutenant P.F. Beaumont and Second Lieutenant Bramald were killed in action. Another casualty amongst the officers was Second Lieutenant C.W. Uncles killed in action 9 October. A total of 5 officers and 40 Other Ranks lost their lives as a result of this action. And what of the wounded? The British stretcher-bearers firstly retrieved the seriously wounded British then the moderately wounded British then the British dead then the German lightly wounded. The German seriously wounded had to be ignored and the enemy dead in No-Man’s-Land were never touched except for souvenirs. Walking wounded were encouraged to make their own way to the regimental-aid posts located a few hundred yards behind the action. Doctors worked on routine first aid and serious amputations. Men were then passed back to another dressing station except for those still needing surgery and they moved to a Casualty Clearing Station. Here ambulances lined up in their hundreds to take casualties to hospitals where the men would “find peace or permanent disability or an anticlimactic death after all.” Roadside dressing stations were in constant danger. German long range artillery regularly peppered the roads and intersections around Broodseinde, Poelcapelle, along the Menin Road and beside the Ypres-Staden railway – doctors themselves were wounded or killed there. The 49th Division was not involved in action on the 12th October or between the 26th and 10th November 1917. These battles more commonly known as the First and Second Battles of Passchendaele. Corporal George Parmley died of wounds 16 October 1917. It is assumed that he was taken to hospital at Wimereux and died of wounds a week later. He is buried in Wimereux, a small town about 5km north of Boulogne in the Pas de Calais, France. From October 1914 onwards, Wimereux and Boulogne formed an important hospital centre and until June 1918, the medical units at Wimereux used the communal cemetery for burials with the south-eastern half having been set aside for Commonwealth graves. 54339 Private Norman Christon, 1/5th Battalion, the West Yorkshire Regiment (Prince of Wales’s Own) was killed in action 9 October 1917 and is buried in Dochy Farm New British Cemetery, Belgium. He is commemorated on Cockfield War Memorial. 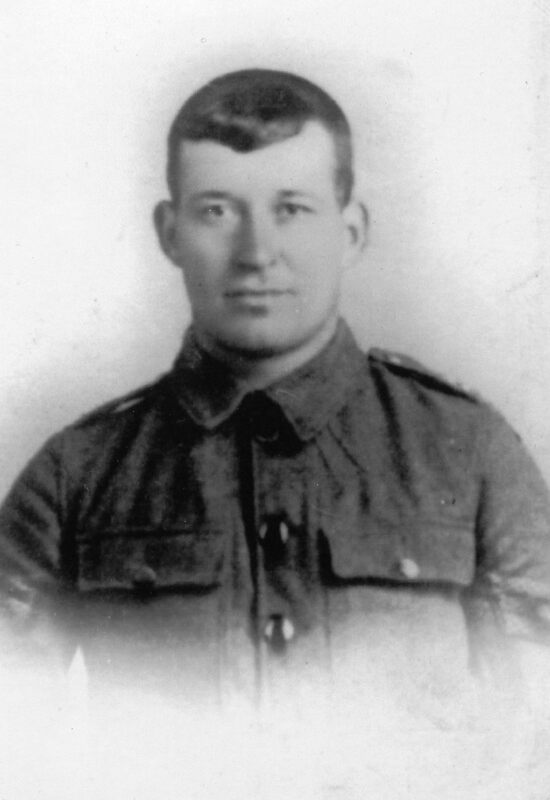 54397 Rifleman Herbert Hall, 1/7th Battalion, the West Yorkshire Regiment (Prince of Wales’s Own) was killed in action 9 October 1917 and is buried in Tyne Cot Cemetery. He is commemorated on Cockfield War Memorial. 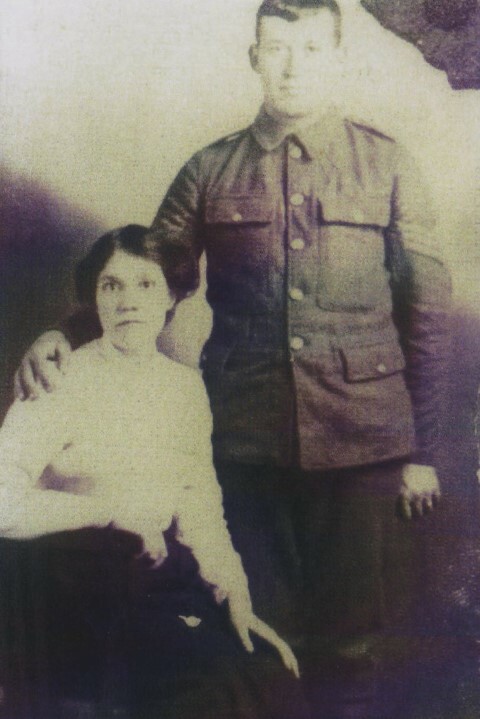 54506 Rifleman Matthew Thomas Raine, 1/7th Battalion, West Yorkshire Regiment, 146th Brigade, 49th Division. He was killed in action 9 October 1917. He has no known grave and is commemorated on the Tyne Cot Memorial. He is commemorated on Evenwood War Memorial. Corporal George Parmley s commemorated on the Evenwood War Memorial and the Roll of Honour, St. Paul’s Church, Evenwood. Memorial Column to the 49th (West Riding) Division: Behind Essex Farm CWGC cemetery on the western bank of the Yser Canal, just to the north of Ieper is the Memorial Column to the 49th (West Riding) Division inaugurated in 1924. York Minster: The name of Corporal George Parmley is contained within the KOYLI Roll of Honour.